TVXQ (U-Know Yunho, Max Changmin) celebrated their 10th anniversary this year. Since making their debut on December 26th, 2003, they’ve grown at an astoundingly rapid pace, selling 4.3 million albums in Korea and 7.87 million albums in Japan, giving them a grand total of 12.20 million albums sold in the two countries. In 2008, they earned a place in the Guinness Book of World Records for the biggest official fanclub, which boasted 800,000 members. 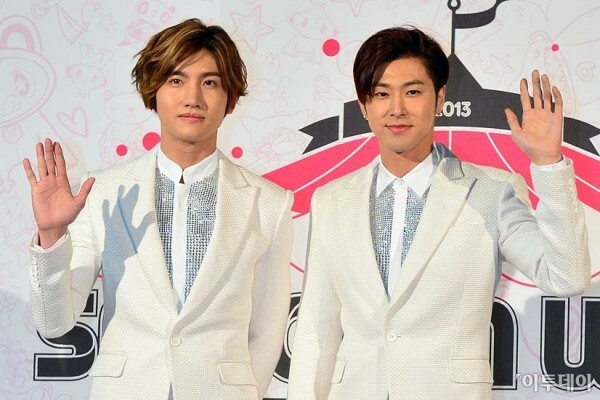 As the pinnacle of K-pop’s Hallyu Wave, TVXQ have captivated the Japanese music market. Making their official Japanese debut in 2005, TVXQ followed a strictly glocalized strategy. At first, their singles sold 10,000 copies and their albums sold 50,000 copies. Shaping SM Entertainment’s Japanese market strategies, TVXQ made their mark in the lives of the Japanese public with endless activities. Their 12th single ‘Summer Dream’, released in 2007, was TVXQ’s first single to top the Oricon daily charts, marking the beginning of TVXQ’s reign. With their 16th single ‘Purple Line’ becoming their first single to top the weekly charts, TVXQ toured a total of eight cities in 2008, attracting 150,000 fans to the event. In 2009, TVXQ performed at Tokyo Dome (50,000 seats per performance), the ‘stage of dreams’, and they became the first non-Japanese singers to perform at Nissan Stadium (70,000 seats per performance) this year. Thanks for the translation. And happy New year to all of you. Your dedication to translating is very much appreciated!